In Pakistan the term “security concerns” can be used for any action or reaction (most probably) against any firm or company, No matter how beneficial would it be for the people or the official usage. This time Pakistan Telecommunication Authority (PTA) is going to block BlackBerry’s Enterprise Server (BES) in Pakistan beginning December 1st this year. BES is BlackBerry’s business solution, operating in tandem with Exchange or Domino servers, the highly secure platform provides companies with autonomous, highly manageable features for BlackBerry devices as well as the applications they use, even how much access they have to different networks or services. The PTA, in turn, sent letters to Pakistan’s mobile operators outlining the requirement that BES connectivity would be blocked by December. 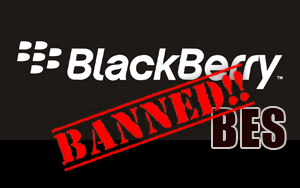 Interestingly, this ban will not affect BlackBerry Internet Service (BIS), the company’s legacy consumer platform that allows previous generation BlackBerry smartphones to get online. Since BES is primarily a business grade service, the PTA’s spokesman, Khurram Mehran, says that he does not expect this move to affect more than 5,000 users in the country. “There was a challenge that the BlackBerry email service could not be tracked or decoded, which leads to the security reasons” that were cited by the Interior Ministry. The decision to block the BES was taken on the directives of the interior ministry due to security reasons. Whether we like it or not, the Pakistan Telecommunication Authority has already sent out emails to local service providers, saying them to block BES communication through their networks by December the 1st, so the measure is going to be implemented, for now at least. It is important to note that this will not affect BlackBerry’s Internet Services (BIS) within the county, so internet access to BlackBerry phones should be fine.